Cost: Varies, depending on materials selected. Approximately $25 as shown. In this simple and contemporary design, I am using the new modern wide oval link chain. I have woven a strand of glass crystal beads through the links, and attached a decorative clasp. One length of wide oval link chain (desired bracelet length, minus clasp). Here I am using about 7 inches of chain. One length of flexible jewelry wire (like Beadalon or Soft Flex). 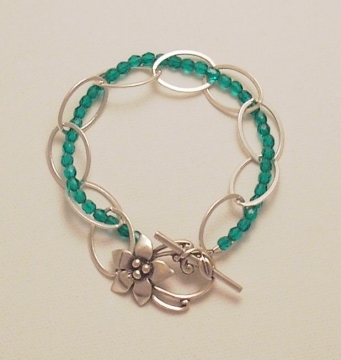 Allow enough wire for the finished length of bracelet plus a few inches. Approximately 50 small beads, or enough beads to fit your bracelet length (about 7 inches of beads). Here I am using turquoise faceted glass crystal beads. 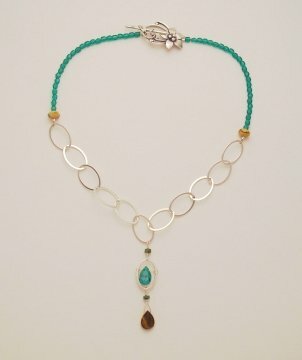 Tie a knot or place a piece of tape on one end of the flexible beading wire and string all of your small beads. Tie another knot to make sure they don't slip off the end. Weave the strand of beads in and out of the links on the oval chain so that the strand passes through every link. Untie your knot or remove your tape from the end of the strand of beads. Slide a crimp bead onto the wire, then loop the end through the loop on the clasp, as well as around the link chain, and pass it back through the crimp bead. Option - if it is easier, you can use a split jump ring to attach the link chain to the clasp. You will use crimp beads to attach the strand of beads. Use your pliers to close the crimp bead. Follow these instructions on How to Use Crimp Beads. That's it! 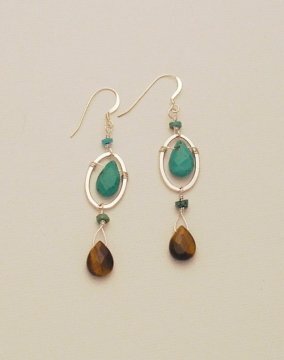 Make the matching earrings and necklace!